I was up at 7:00 a.m. and was feeling pretty pleased with myself until I ran into A., who told me she had been up since 5:30 a.m. doing yoga and chores. We had breakfast together (I had a delicious omelet with onion and ginger and more papaya!) and then I started doing some preparatory work for my first “official day”. Pradeep had told me there would be a test. I knew he was joking, but I still wanted to refine my goals for the internship. I decided that I wanted to write up detailed case studies of each of the different OASiS innovations (there are 5), and from these case studies pull out the method used to define the “problem” and develop, refine and test the “solution”. I want to then decide which steps of the method are appropriate for the McMaster Lab. I also decided that I was ready to throw out that plan at a moment’s notice if something more interesting happened. I said as much to Pradeep, who told me that he had anticipated I would say that and planned accordingly. He suggested we start with a case study of the Museum School project and proceeded to tell me the story of how it came to be. Or, at least, part of the story. He and Shibani noticed a gap between the education offered by private and public schools. Government-funded public schools had no accountability in terms of quality, and were lacking in terms of infrastructure and aptitude of teachers. Private schools, in competition with each other to secure paying students, offered higher standards of education, but only focused on academics – as measured by national examination scores. Many poorer children do not bother with school because of its low quality. Attempts had been made by other NGOs and the government to remedy this – by infrastructure improvements in the schools, teacher training and recruitment programs, even a “Right to Education” act that mandated school attendance for children up to 16 years of age and provided for improvements to all aspects of the school (but had no clauses about quality of education, interestingly). These attempts had not, in the Ghoshes’ opinion, led to any significant lessening of the gap. What they did was look at the problem from a potential student’s perspective. They followed around rag-picker children (who start work at 5:00 a.m., scavenging for scraps of cloth they can sell) and asked them why they did not go to school and what would make them want to attend. The children wanted something fun that allowed them their freedom. 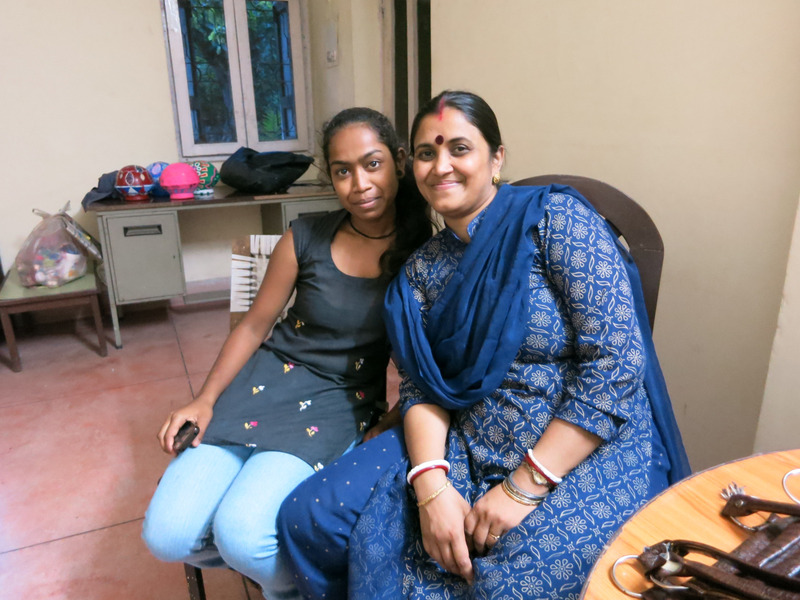 This type of schooling wouldn’t even be possible in a private school, so Shibani and Pradeep decided to try something different. They identified five promising alternative models of Indian education and did extensive site visits at each. One school’s premise was that nature was the best teacher and so looked to the outside world for lesson topics. Another challenged students to learn six languages; their mother tongue, their national tongue, the global tongue (English), a foreign tongue, a regional language and another of their choice. Some had no examinations, and others used periods of learning that were five years instead of one year. Through these experiences, the Ghoshes began to unlearn the assumptions they carried about the way that education should be provided. They began to criticize the education system itself (finding fault even with private school offerings) and started to develop a holistic curriculum that aimed to take a child from learning about proper behaviour to being entrepreneurial. All that was left was to find the place to teach and the teachers. At first they were considering parks, but then realized that a museum could provide rich teaching aids. They established relationships with Bhopal’s museums – so that the museum staff would train the teachers on how to teach the exhibits. For teachers, they went to colleges with Bachelors of Education programs and suggested that students wanting to complete their practicum could come and teach with them. And so (and believe me, that “so” is a tiny word that stands for a lot of work) the Museum School project began. It has been running for seven years now, kept alive by the dedication and passion of Shibani. Today, I was lucky enough to get to go with her to one of the museums and see the program at work. And so, after an incredible lunch at the Ghosh home (more practice learning how to eat with my hand! ), I told Shibani how good it was. Pradeep replied, “Oh, it’s not for you we’re doing this, it’s for the blog. We want to make your friends jealous so they come over too!” Actually, “It’s for the blog” is a commonly repeated phrase even a few days into this trip. So you’re a part of my adventure, people! 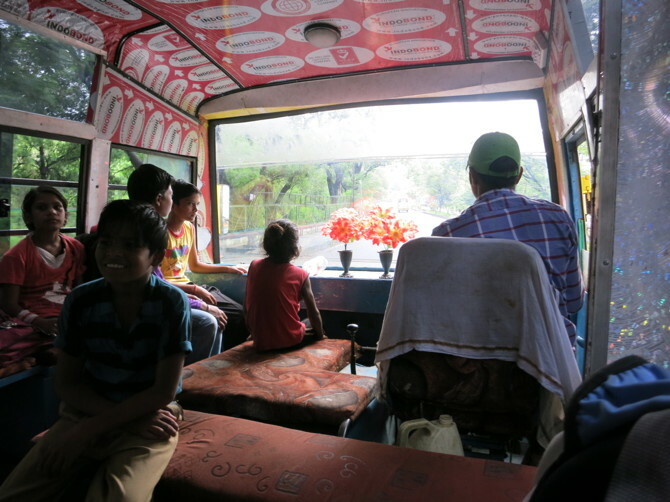 Thus I found myself on a bus full of children weaving through the morning traffic. And perhaps I’m just not around children enough, but these kids were so beautiful! And full of life. We headed out to the museum, which was atop a set of rolling green hills near the city (Bhopal is a very green city – so much foliage. The rainy season definitely brings out the best in it). I watched as the children filed out of the buses (which go to their homes to pick them up – mostly from slum areas), lined themselves up by height, said a prayer and then sang the national anthem. Then, they were off to their two hours of lessons, dividing themselves into groups by achievement level (what skills they’ve mastered), not age. I spent time with the children at lower levels, watching as teachers instructed small groups on reading, writing and “hand skills” (painting was today’s activity). The small “class” sizes, with a teacher sitting on the floor with about ten students sitting around her, really struck me. What also struck me was the sense of purpose and focus the students brought to their tasks. They were genuinely engaged in their learning. The students I spent time with weren’t yet at the level to learn from the museum exhibits, but I am sure that on another visit I will get to see that part of the teaching too. The kids also pretty much only spoke Hindi, so my ability to interact with them was pretty limited. I didn’t want to distract them from their tasks, either. While I observed them, I talked to Shibani. I learned from her. She is the soul of this project. Her dedication to the children and to the act of learning itself came through to me so clearly. She told me that she used to cook food for all one hundred and twenty (or so) of the children every day so they would have a guaranteed meal (because often they would otherwise go to bed hungry). She spoke about her new goal of combining the teaching topics of each exhibit in a museum into a story that even the younger children can follow. Later on, as she was dropping me off, she told me about the annual showcase OASiS puts on for the students of the museum school, where they can perform a dance, play or song for an excited audience. This year, the theme is “The Life of a Girl”, and the production will explore and celebrate the different roles women play throughout their lives. During the school day, I watched as a group of teachers and students practiced a dance for the showcase. At first, the teachers were dancing behind the students, guiding their every move. Then, the two separated and the student looked back to the teacher, who urged them to go forward and dance. It was beautiful out of context, but even more so when Shibani explained that the song they were dancing to meant “The confidence I’ve given you should not be shaken. The dreams you’ve dreamed with me should still be yours to reach for.” The dance was about girls taking wing away from their mothers and becoming independent. 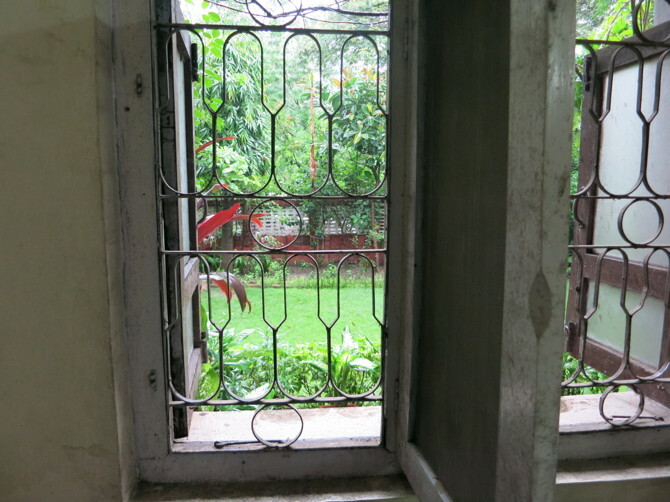 I, on the other hand, am not being very independent here in Bhopal and I am loving it. I’ve received help at every step; been given answers to all my questions. I am humbled by the support I’ve been given from people who barely know me. I feel safe and at home – albeit a very colourful, busy and rainy kind of home.